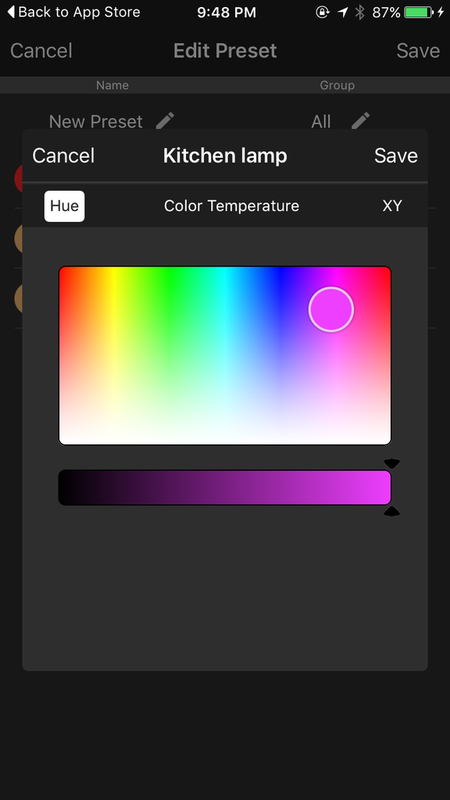 Hue Pro app (aka “best Hue app ever”) now available on iOS! Get the most out of your $60 lightbulbs with this 99 cent app! 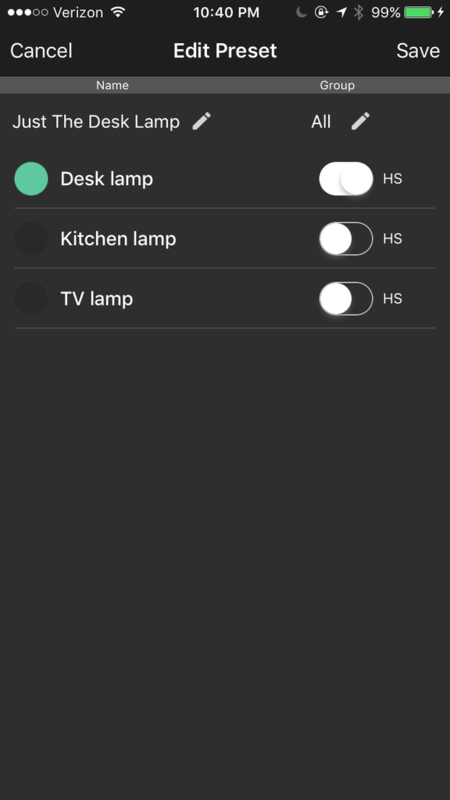 Hue Pro – the go-to Philips Hue app on Android for over a year now – just arrived on Apple’s iOS! Philips Hue / iPhone users, rejoice! Hue Pro is awesome. This little 99 cent app from a third party developer is everything the official Philips Hue app should have been. 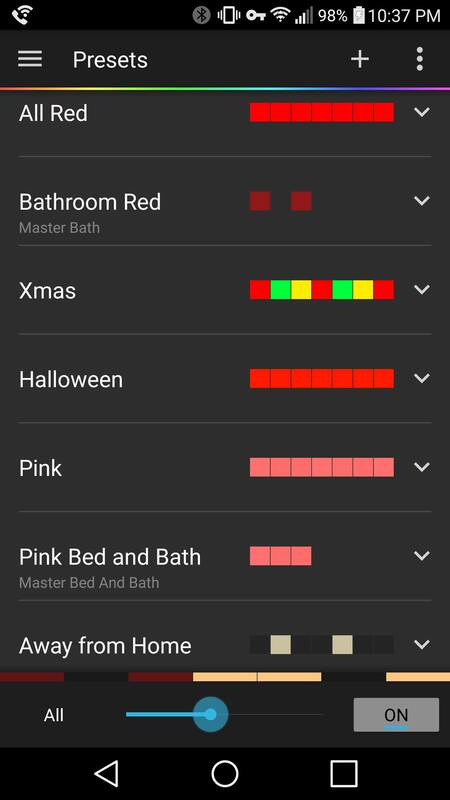 It’s been the Android Hue app of choice for well over a year, but there was no good equivalent on iOS. Some apps could do a few things well, but none seemed to have complete mastery over the Philips Hue ecosystem the way Hue Pro did. Make presets with ease! First thing you see in Hue Pro is a list of all your presets. This makes it super easy to instantly change the color of your bulbs. Add your own preset by tapping the + in the upper right corner. Modify each bulb to your liking and save. Color picker! Instead of selecting a photo and picking colors out of it to create your Hue light palette (it’s as terrible as it sounds) you can just pick colors out of a color picker. It’s so easy in Hue Pro! Pick a lightbulb, pick a color, save, repeat. Good preset palettes. 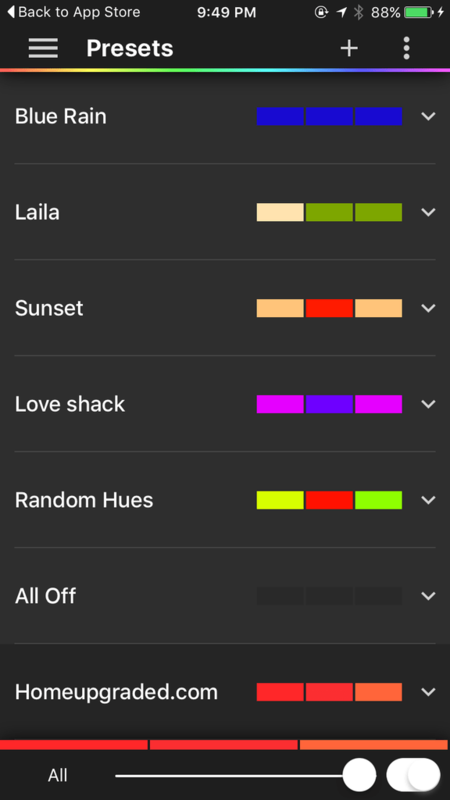 Hue Pro comes with some excellent color palette presets, and it’s easy to add your own (click the + button). My favorite presets are Blue Rain and Love Shack, but most of ’em are pretty nice. At the bottom is one of my own presets. Manage all your bulbs. See how there are three colored boxes next to each preset name? Each one represents a bulb attached to this location’s Hue hub. (In other words, I’m in my apartment where I have 3 Hue bulbs.) Over at my house, I’ve got 7. This screenshot is from the Android version of Hue Pro. You might notice that some presets don’t even include all the bulbs. That’s because you can toggle the “HS” slider to keep some bulbs off when using a particular preset. Below, I’ve made a preset that only lights the desk lamp. Great menu design. 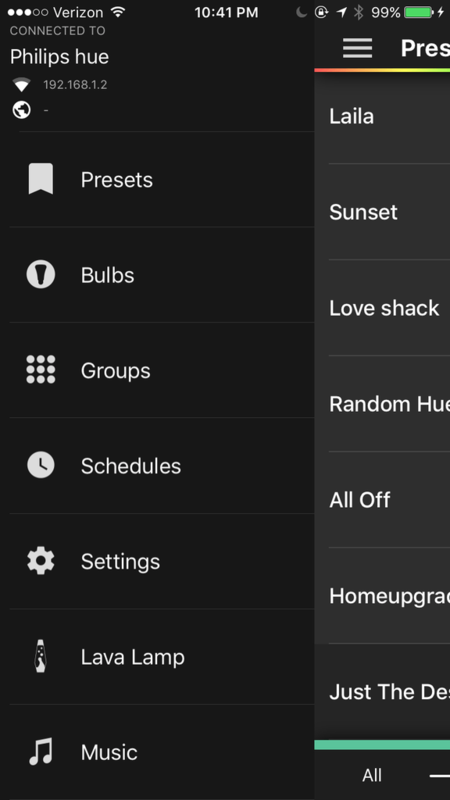 Over in the hotdog menu (tap the 3 parallel bars in the upper left) you’ll find quick links to the various sections of the Hue Pro app: your presets, bulbs, schedules, settings, and more. Clean and simple – awesome! 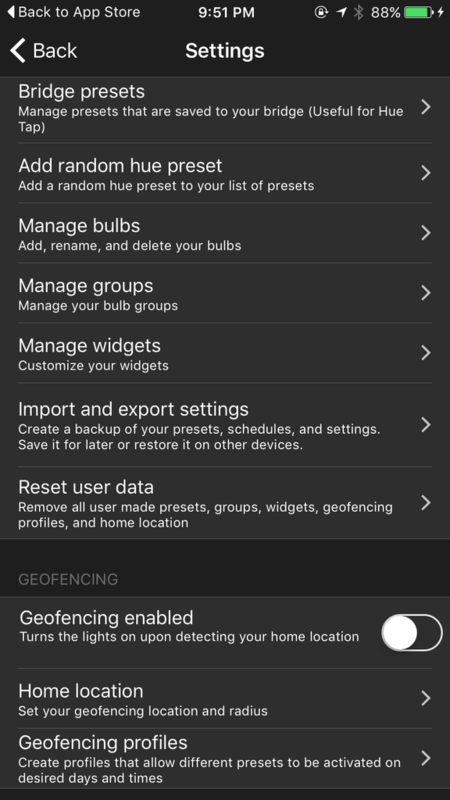 The settings page offers tons of tweaks and ways to manage your Hue lights. Hue Pro does more than just change bulb colors: you can adjust your bridge settings, manage geofencing, make backups of your settings, and more. I’m so happy to see this app land on iOS – great job, Prismatic LLC – what a happy surprise for this iOS user who was wishing for a better Hue app!